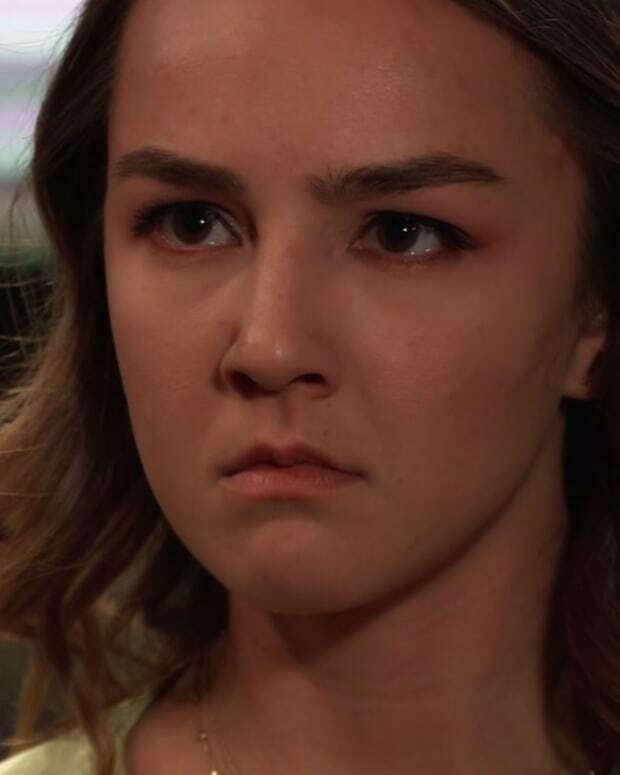 Kristina wants a job and tries to convince Julian to hire her as a bartender. Julian doesn&apos;t want to make waves with Sonny. Valerie (who?!) shows up to give Julian a notice that the city has approved his renovation plans. Jordan tells Curtis the lawyer is being brought to them so they can question him about Madeline. Curtis shows him a photo. Mr. Buckley says he has an obligation to protect his clients. Jordan warns him she can have his release revoked. Mr. Buckley admits that Madeline hired him to find parents for Nina&apos;s baby. Curtis asks who the baby was given to. Mr. Buckley doesn&apos;t remember and has no records. After he leaves, Curtis tells Jordan there&apos;s a private nurse and delivery doctor somewhere out there. He&apos;s going to follow the money trail to find them. Jason stops by to talk to Sam about Danny. She tells him Kristina is back and living with her. Sam feels Kristina needs to be supported and not pressured. Drew arrives, wanting to see Scout. Mike questions Sonny about how much trouble his Croton body fiasco will get him into. Sonny isn&apos;t concerned. He says he has the resources to deal with it and Mike needs to let it go. Nina receives a package from her mother&apos;s lawyers. There&apos;s stuff from her childhood inside. They include pictures of her and Nathan, and her mother&apos;s jewelry box. Inside the box is a heart necklace that Nina loved to play with as a little girl. Oscar is released from the hospital and heads to the park with Joss for their interrupted celebration. The two make out and decide to make a bucket list of everything they want to do together. Drew spends time with Scout and Sam notices that something&apos;s wrong. Drew tells her about Oscar spending the night at the hospital. Sam asks if it&apos;s serious. Drew admits that Oscar has a malignant, inoperable brain tumor and knows nothing about it. Drew says Kim wants him to be a regular teen, but he feels Oscar has a right to know. Drew&apos;s upset that he hasn&apos;t had enough time with his son and he doesn&apos;t like keeping this secret. Sam says miracles happen every day and he needs to spend as much time with Oscar as possible. Sonny gets the call that Julian got his permit and gets upset. Jason says they can control the contractors and put one of their own men on the crew. Jason figures he can keep an eye on the renovations and find the body first. Julian realizes he&apos;ll be busy with the renovations, so offers Kristina the bartending job. Mike manages to sneak away from his day nurse and heads over to the bar with a monkey wrench.